The long exposure clouds here almost seem like a surreal blanket of strange and crazy, descending onto a peaceful beach, which made me think of the Blade Runner world. Add in the volleyball net for some mystery. When you are living on the 6th floor of a beachfront condo for a week while on vacation in Fort Walton Beach, Florida, the main attraction is the beach. I was excited to get something unique while there and have always been fascinated by long exposure clouds streaking across the sky. 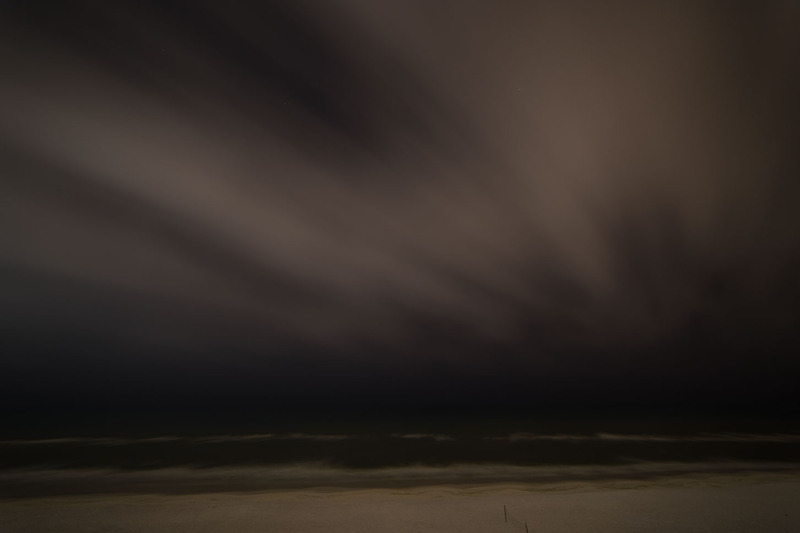 So one night around 11:30pm, with some clouds in the sky, it was time to have fun and experiment ! I used my Rokinon 14mm on a tripod for a 25 second exposure to get the effect. Here is a straight out of camera, with lens profile for the Rokinon, added in Light Room. The cloud pattern is there, but it looks rather blah. After seeing Blade Runner 2049 this year I’ve been listening to Hans Zimmer more and more and even added up a radio station in Spotify so it’s easier to queue up ! Here is 2049 from the soundtrack on YouTube.